Maryland Shingle Roofing & Siding Contractors offers a wide selection of siding brands, colors and styles for complete siding installation or siding repair of Maryland homes. Call today for a free estimate! 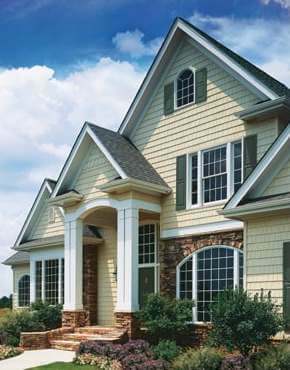 Maryland Siding Contractors install a variety of vinyl siding. Selecting the siding that’s right for your home and choosing among Maryland siding contractors can be a daunting task. At Maryland Shingle we can help. Our friendly staff make the selection process and installation of your new siding a pleasure. Let’s look at selecting a high quality siding first. After installing Maryland siding for over 25 years we have a few top selections you may want to strongly consider such as Certainteed Monogram vinyl siding, Certainteed Cedar Impressions vinyl siding and Certainteed Carolina Beaded vinyl siding. Sure, we install all types and brands of siding but our highest recommendation we reserve for these three great Maryland siding choices. With Certainteed Monograms large color palette, certilock locking system, full 3/4 inch panel projection, premium thickness, exclusive double thick .088 siding nailing hem and 180 MPH wind resistance this Maryland Shingle choice is a winner. Now picking a great siding is very important but there is something just as important. Which company from among Maryland Siding Contractors are you going to trust installing this great looking siding? At Maryland Shingle Roofing & Siding Contractors quality workmanship and attention to details are just as important as the quality siding we install. Many things go on behind the scene of a quality installation of siding. Details like correct nail size and placement that assures the siding is secured to the framing of your house for that lasting installation. Using forty-five degree cuts on siding J-channel around window and doors frames for that clean look on your home. How about using color coordinated accessories for gable vents, light blocks, outlet blocks and dryer vents? And to compliment your new Maryland siding job we can also wrap all your wood trim in maintenance free PVC coated aluminum trim capping in accent or color coordinated siding colors. You see a great looking Maryland siding job starts with a quality siding and ends with a beautiful installation on your home! When it comes to re-siding your home there really is only one best choice among Maryland Siding Contractors and that’s Maryland Shingle Roofing & Siding Contractors, siding Maryland homes with beautiful new vinyl siding one house at a time!